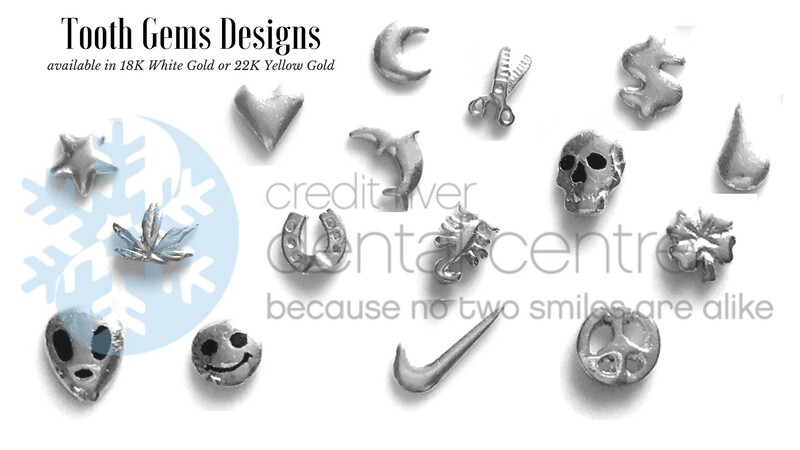 When you want to Accessorize Your Best Accessory or just add a little shine to your smile, your team at Credit River Dental Centre can definitely help you give your smile that extra sparkle. 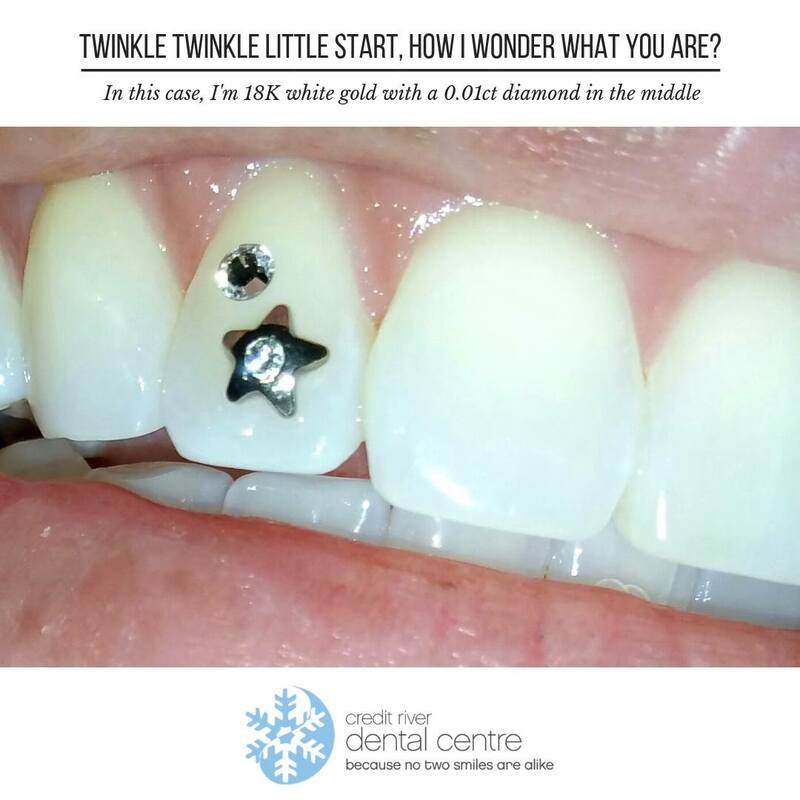 Whether you want just a touch of sparkle or the brightness of a diamond paired with 22K yellow gold or 18K white gold, your Port Credit Dentist at Credit River Dental Centre can give you options you may not have even thought of. 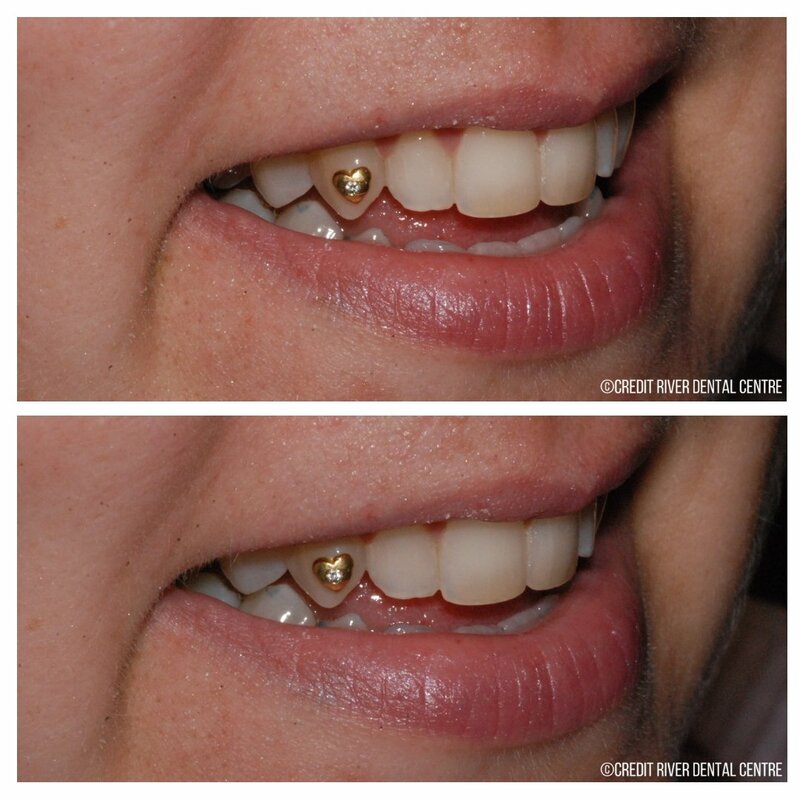 Since the tooth gems are made of 18K white gold, 22K yellow gold or lead-free Swarovski crystals, allergic reactions are rare and they will maintain their brillance and shine as long as they are cared for well. Accessorizing Your Best Accessory with Tooth gems is a painless, simple procedure lasting only about 10 to 20 minutes in length depending on the number of stones and design selected. The tooth is prepared to ensure that the surface is clean for maximum adhesion. A bonding agent and adhesive agent are then applied and cured with a light. The light used for curing the adhesive material is the same light utilized for curing of the filling materials used in the field of dentistry. Note : Our office uses high quality adhesive resin to ensure the longevity of your new tooth jewel. 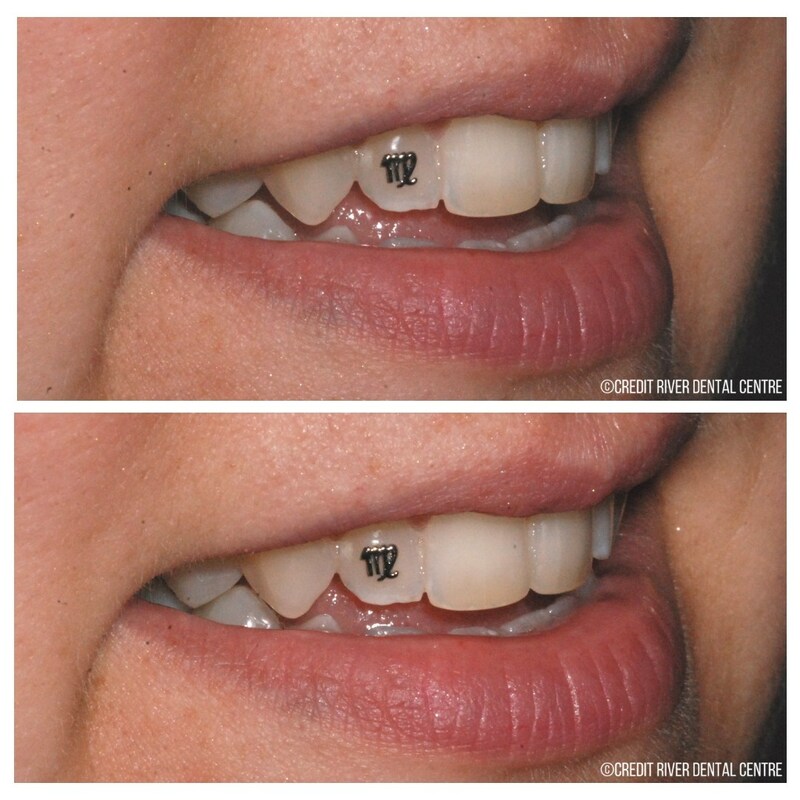 Click on the photo below to see the tooth gems close up. Caring for your tooth jewelry is simple. As recommended by our dental team at Credit River Dental Centre, it is important to brush at least 2x daily and clean in between the teeth on a daily basis. Cleaning around your tooth jewel will ensure that retentive foods don’t stick to the jewel trapping unwanted food debris. There are no special instructions after the adhesive has been cured. You can eat and drink as usual right after the procedure. Since the tooth jewel has been professionally applied with a durable resin, it must be removed by your dental professional. This procedure is also simple and painless. We require approximately 10 to 15 minutes of time to remove the jewel and smooth out the surface of your tooth. 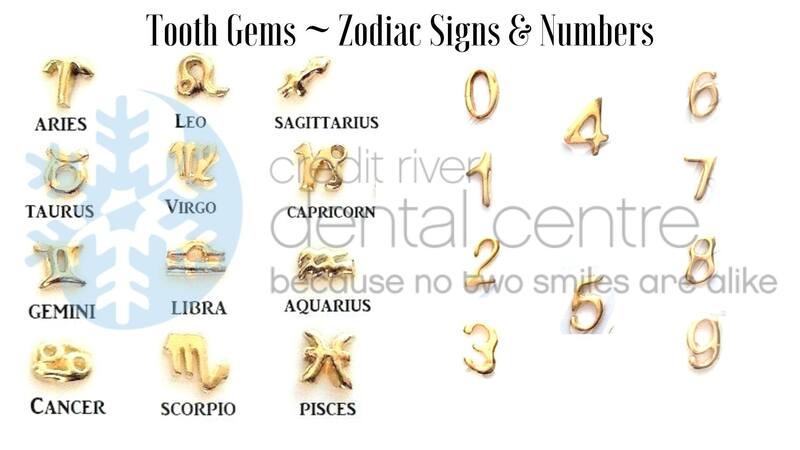 So if you’re thinking if adding a little bling to your smile, think of your team at Credit River Dental Centre where no two smiles are alike! Accessorizing your best accessory whether it be through tooth jewelry, cosmetic dentistry or orthodontic treatment, you can count on our team to give you the sparkle to your smile that you've always wanted!